The Korean entertainment industry is thriving—it now appeals to international audiences. K-dramas are notorious for being fabulously addictive, and how do you get the most out of this oh-so-good addiction? You go to Seoul and soak up every bit of it. Here are nine Seoul destinations to pin on your Google Maps now. Cozy up to your favorite “Hallyuwood” actors at the Grevin Seoul Museum—which carries the world’s biggest exhibition devoted to them. There are 80 life-sized wax models of internationally recognized figures and celebrities. 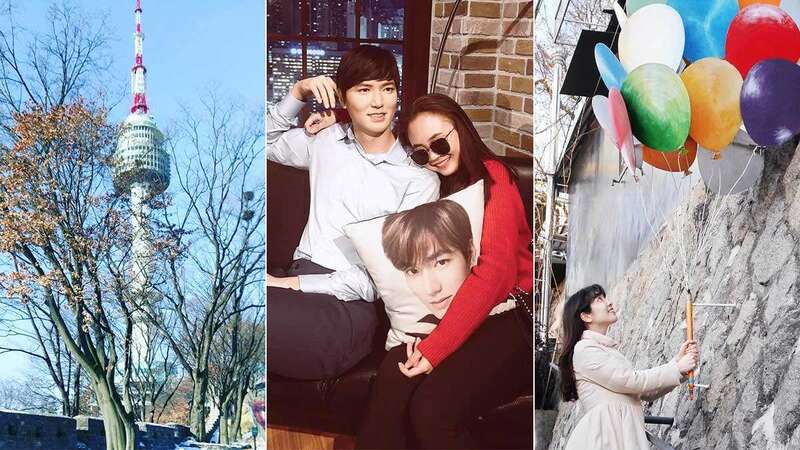 If you’ve ever dreamed of grabbing a selfie with Kim Soo-hyun, Bae Yong-joon, Park Shin-hye or Jang Dong-gun, then prepare to fill your camera rolls and drain your batteries here. Fans of The Coffee Prince are still flocking to get their caffeine fix in Hongdae, because this is where the legendary drama was shot. Relive the whimsical love story between Choi Han-gyeol and Go Eun-chan over a hot latte and cake at the Coffee Prince 1st Café. There are tons of photos and memorabilia scattered throughout the venue. Note: Photos are not permitted without a drink or food purchase. The Digital Media City in Sangam-dong is where K-drama magic comes alive. It is home to major broadcasting stations including MBC, SBS, and CJ E&M, and a free-to-enter Korean Film Museum. Behind Digital Media City is the DMC Culture Park where scenes were shot for K-dramas including Because This Is My First Life, The Best Hit, and The Liar and His Lover. If you’re lucky, you may even get a glimpse of actors between takes. In the middle of the park there are a number of stunning art sculptures used for the backgrounds of those hit shows. N Seoul Tower (also known as Namsan Tower) is a symbol k-drama romance. It’s where Min Joon and Song Yi do a love lock in My Love from the Star, and where Jun Pyo and Jan Di re-enact their first date in Boys Over Flowers. It stands 237m atop Namsan Mountain, with a cable car service to take you to the entrance if you want to avoid messing your hair before photo time. Oh, and the views are pretty spectacular, too. Architect Zaha Hadid designed this interestingly shaped building to house exhibition halls, retail stores, and leisure spots, but little did she know that her structure would serve as an iconic backdrop to some of Korea’s most popular TV series and movies. The Dongdaemun Design Plaza has been featured in The Producers, My Love from the Star and She Was Pretty, plus variety shows including Infinity Challenge and Running Man. This is one of the most Instagrammed landmarks in Seoul, so expect to be spoiled for angle choices when recreating your favourite scenes. Mural Village in Ihwa-dong is where Lee Gak (Park Yoo-chun) went on a fairytale date with Park-ha (Han Ji-min) in Rooftop Prince. Strolling through these romantic roads and stairways will make you feel all warm and fuzzy inside. There are plenty of graffiti artworks, coffee shops, and outdoor installations that make this village a worthwhile visit even for those non-K drama addicts (aka boyfriends). This trendy shopping district is a haven for everything from international fashion to local cosmetics. Myeongdong has the greatest concentration of “hallyu shops” or “idol shops” selling merchandise. It is also is a popular film destination for dramas including You’re Beautiful—where Mi Nam shopped and ate kalguksu (Korean knife-cut noodles). If you love Goblin, then you’ll fall head over heels for Unhyeongung Western House. The gorgeous white mansion is where Kim Shin (Gong Yoo) lived and shared many memorable moments with Grim Reaper (Lee Dong Wook) in the drama series. The building serves as an office building for Duksung Women’s University and is located directly behind the Unhyeongung Palace. Seoullo 7017 is an overpass that was converted into a walkway, and despite opening less than a year ago in May 2017, has already been used in scenes for recent favourites Live Up To Your Name and Fight For My Way. There are tons of cute attractions along the route including gardens filled with evergreen roses and pine trees, shops, cafes, art and even puppet theatres. For k-drama fans, this is a walk to remember.